The Tata group, India’s largest business house, has not done as well as the others in the current bull-run on Dalal Street. 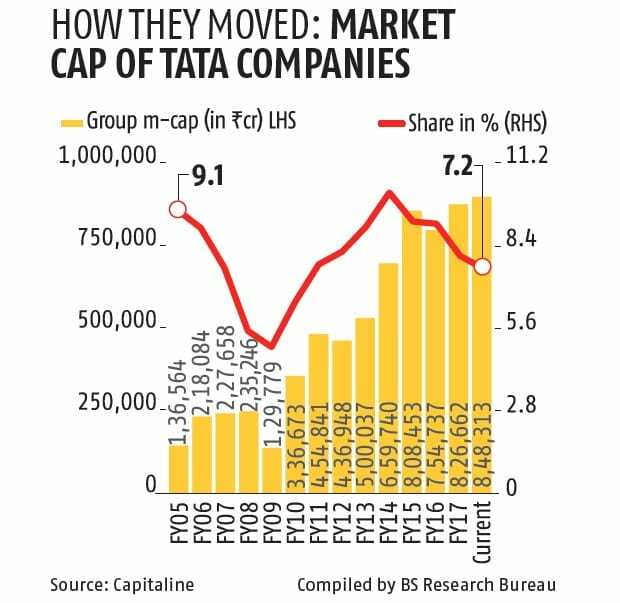 The share of market capitalisation (m-cap) of listed Tata group companies is down to a seven-year low of 7.2 per cent, as key group companies such as Tata Consultancy Services (TCS) and Tata Motors have underperformed the broader market in the last few years. 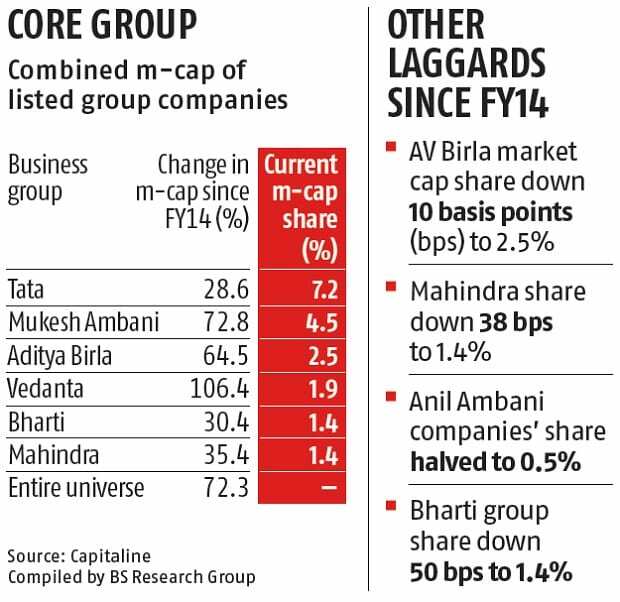 At its peak, Tata group companies accounted for nearly 10 per cent of the combined m-cap of all listed companies on the bourses at the end of FY14. Even in the short-term, the trend is similar. The group’s combined m-cap is up 10 per cent in 2017 so far, against 25 per cent rise in the broader market during the period. Analysts attribute this to a slowdown in the information technology (IT) sector and the group’s absence from sectors such as private sector banks, non-banking finance companies, cement, logistics and non-ferrous metals, among others, which are currently being favoured by investors. “A slowdown in IT exports had made TCS a laggard on the bourses, which pulls down the numbers for the entire group. 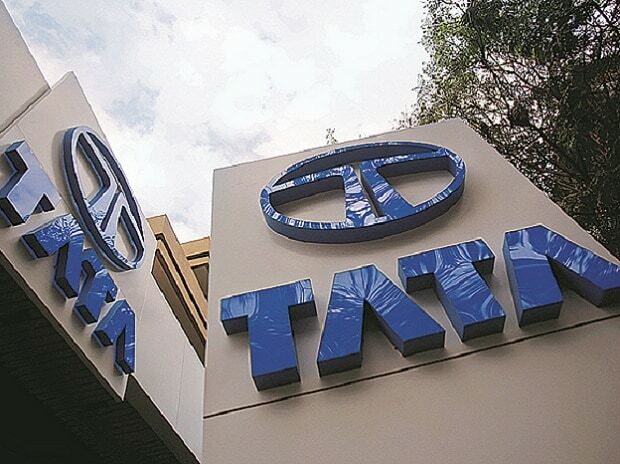 The second-most valuable company, Tata Motors, has not done well either,” says G Chokkalingam, managing director, Equinomics Research & Advisory. The TCS stock price is up 6 per cent in 2017 so far, while Tata Motors is down 5.7 per cent. Together, these two companies account for 78 per cent of the group’s total m-cap. On the brighter side, 17 of the 29 listed group companies have outperformed the broader market during the year so far, but it has not moved the needle due to their small size. This includes large-caps such as Tata Steel and Titan. However, the latter two together accounts for only 13.3 per cent of the group’s combined m-cap. The analysis is based on the current and financial year-end m-cap of a common sample of 813 companies that are part of the BSE 500, BSE MidCap and BSE SmallCap indices. The data is from the beginning of fiscal year ending March 2005. TCS was listed in the second half of 2004. The groups that have gained include those with exposure to fast-growing and investors’ favourite sectors such as oil refining (Reliance Industries), financial services (Bajaj and Hinduja), non-ferrous metals (Vedanta), cement (Aditya Birla), consumer plays (Eicher and Godrej), among others. For example, Hinduja group, which owns IndusInd Bank and Ashok Leyland, saw its m-cap rise 289 per cent since FY14. In the same period, Bajaj group’s m-cap was up 247 per cent, thanks to a great show by Bajaj Finance and Bajaj Finserv. The Godrej group’s m-cap was up 146 per cent during the period, courtesy a strong show by Godrej Consumer Products and Godrej Properties. Another smaller business group, Eicher, has been the top performer with the group m-cap up 488 per cent in the last three years. Among large business groups, Mukesh Ambani-owned Reliance Industries group has raised its m-cap share in the last two years after being a laggard for nearly a decade. Led by Reliance Industries, the group’s m-cap is up 22 per cent since March 2016, against 9 per cent rise in the m-cap of all listed companies. The country’s third-largest business house, Aditya Birla group, has been able to maintain its m-cap share in the last three years, owing to a continued good show by UltraTech Cement and the recent recovery in the stock price of Hindalco Industries.